Fr. Richard Walz, OSB, began making Habanero Pepper Sauce while stationed in Belize, Central America. In early 2003, when Fr. 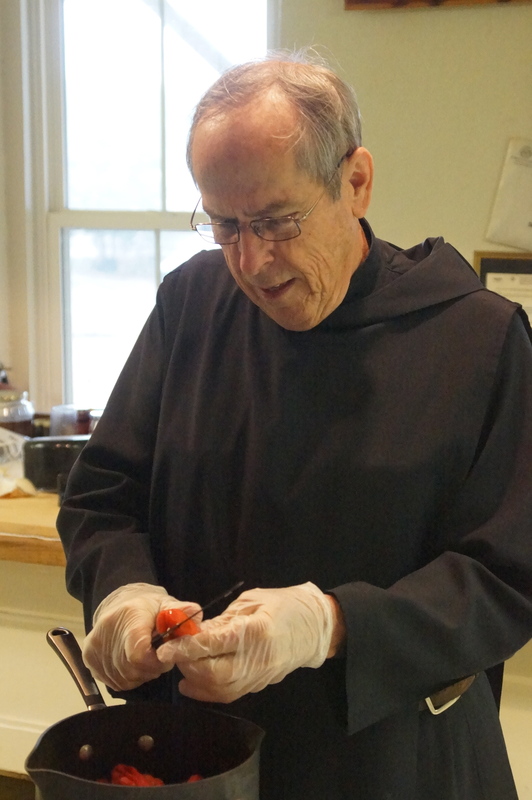 Richard returned to Subiaco Abbey in Arkansas, he brought with him some seeds of the Habanero peppers he had been growing in Belize and planted them in the garden of our Arkansas River Valley monastery. During this first year, perhaps 140 gallons of “Monk Sauce” was prepared and either sold or given away to friends of Subiaco Abbey. Since that time, and thousands of bottles later, Subiaco Abbey “Monk Sauce” has now become a regional favorite and is sold nationally and internationally. Both red and green varieties are available for the “Monk Sauce.” They are both made from Habanero peppers grown here at the abbey – the red being from mature [ripe] Habaneros and the green being from unripe or green Habanero peppers. They begin in the winter months with Fr. Richard growing starter plants from the previous season’s seeds. We then plant them in one of two prime locations that takes advantage of the soil conditions. Careful watering and Arkansas’ day heat and night coolness, combine to provide robust Habanero pepper plants. We pick the peppers when they are either at their peak growth while green (producing our green sauce) or when they reach their full ripeness where they turn red (producing our red sauce). We then move to making our famous sauce. While using a special recipe of onions, garlic, vinegar and salt to provide a robust flavor, the thing that sets our Habanero Pepper Sauce off from others is the generous amount of peppers we use. It is that simple! Larger producers may maximize their profits by reducing the number of peppers in their production, but we increase our quantity of peppers to give it a distinctive taste and heat. The Habanero pepper is a very tasty pepper and the more you use the better the sauce tastes and the hotter it gets. Some friends in Belize told Fr. Richard that he should label the sauce: “Industrial Strength Hot Sauce!” Tabasco® Habanero Pepper Sauce clocks in at over 7,000 on the Scoville Heat Unit scale, while our “Monk Sauce” clocks in at 250,000 Scoville Units. Heat plus an intense flavor yields a Habanero “Monk Sauce” that is truly heavenly!